One of the most popular Australian sports betting websites is certainly Sportsbet. The company was formed in 1993 and in 2005 was taken over by Matthew Tripp who eventually expanded the company from eight employees to more than 250. before moving on to CrownBet. In 2009, Sportsbet was acquired by giant Irish sports betting company Paddy Power, but Sportsbet does run as a separate entity. Sportsbet is well known for huge amounts of advertising at the largest sporting events in the world and is arguably the most well-known betting company in the country outside the TAB. Find out more information in our Sportsbet review. 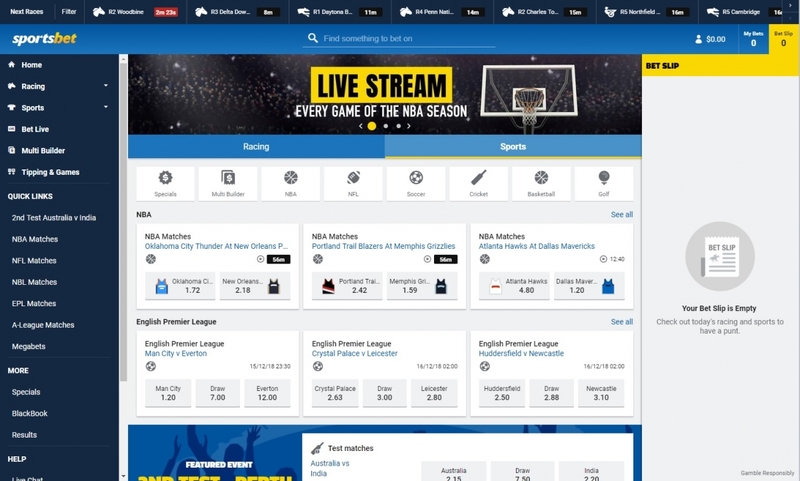 As soon as punters load up sportsbet.com.au it will become very clear that they are dealing with a very slick and easy to use sports betting website. All betting options are mapped out clearly as it’s easy to find categories clearly in the left hand column, while the current promos and a list of upcoming races are displayed in the centre column. Placing a bet is very simple at Sportsbet, with a betting slip displayed on the right-hand side below all the account options and login area. Like many Australian bookies, there is certainly a focus on betting on horse racing at Sportsbet, though the site is well known for having one of the largest selection of betting markets including sports from all around the world and even entertainment betting such as betting on the outcome of reality programs and the results of award shows like the Oscars. One big positive of choosing to open an account at Sportsbet is that they are a massive company with a great reputation for safe transactions and safe handling of your money. Punters will find it easy to deposit on Sportsbet and just as easy to verify their accounts and withdraw their money. Withdrawing was recently made even easier as Sportsbet introduced their Sportsbet Cash Card which allows punters instant access to their money at any ATM. This card can also be used in any stores where Eftpos is accepted. Introducing this ATM card was a great move by Sportsbet as there is nothing worse than having a win punting at an online sports book and it takin days for the winnings to appear in your bank account. Considering their size, it’s not surprising that Sportsbet are known for running some of the best regular promotions in the country, including money back specials and betting bonuses. There are often specific promotions running for multiple different sporting events every single day. Sportsbet do seem to focus their business model and marketing on recreational and new punters and therefore the more advanced or professional punter is often forgotten. A common complaint is that Sportsbet are known to limit the action, or ban accounts all together, for winning too consistently. Taking all of this into account, Sportsbet might not be the best place for a professional punter, but it’s certainly a great site for small-time punters looking for a simple and safe betting experience and looking to cash in on some great promotions on a huge amount of sporting events. Sportsbet is also committed to responsible gambling, launching a $1.5 million 'Take a Break' ad campaign in 2015 which shows that aren't all about fleecing punters of their cash. For a limited time only, if you sign-up to Sportsbet through Before You Bet you will be able to cash in on an exclusive $600 bonus offer. This enhanced offer is only available through Before You Bet, so be sure to take advantage of this great bankroll booster! If you want to cash in on the full $600 bonus bet offer, then you first must click on one of the links here at Before You Bet, then sign-up for an account and deposit. The next step is to place your first bet of up to $600 and then that bet will be matched with a $600 bonus bet! If you don’t want to deposit and bet with the full $600 then don’t worry, Sportsbet will match any first bet at 100% up to $600 – that means if your first deposit is $50 then you will receive a $50 bonus bet and if your first deposit is $150 then you will get a $150 bonus bet and so on. You can find full terms and conditions of the Sportsbet bonus bet on their website, but the important things you need to know is that the bonus bet must be used on one bet (meaning the amount can’t be split into smaller amounts), the bonus must be used within 30 days and you will only be credited winnings from the bonus bet, not the initial bonus stake. Don’t forget that if you go straight to Sportsbet then you will only be greeted with a $100 bonus, but if you sign-up through before You Bet then you can cash in on an enhanced $600 bonus!